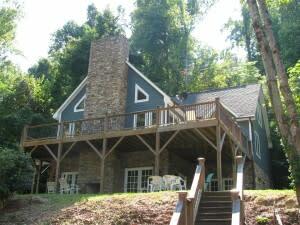 Lured Inn is a beautiful Lakefront home on one of the most beautiful lakes in the world – Lake Lure. 5 Bedrooms, a fully equipped kitchen, two fireplaces, and an awesome game and recreation room complete the package. Enjoy roasting hot dogs and marshmallows in the large outdoor fireplace on the deck overlooking the gorgeous cove. 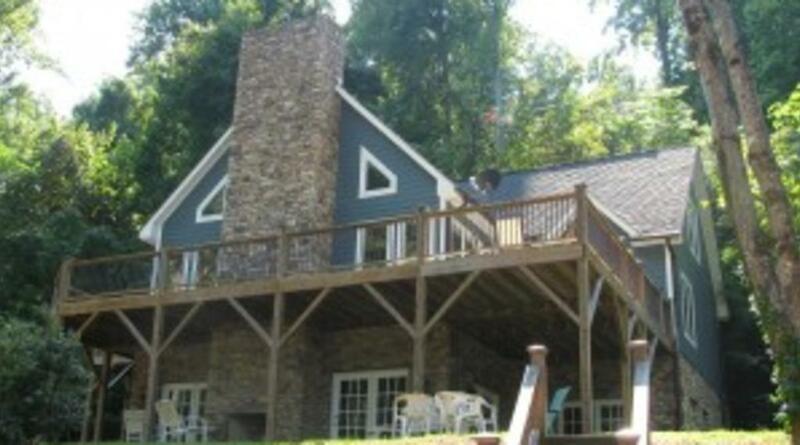 The Lured Inn has a large wrap around deck overlooking the lake for cookouts, sunbathing, and relaxing or you can cater yourself a more elegant affair. Enjoy the sunset from the love seat swing on the patio while the little one’s enjoy the child’s swing set on the lower lawn area. Of course the boat dock and boat house allow lake access for water sports, fishing and swimming. The pool ladder provides for easy entry/exit. There will be two kayaks and a paddle board available for your use to enjoy all that Lake Lure has to offer. You might also arrange to bring your own boat as long as you secure the proper permits or you might rent from a local marina. The wonderfully furnished Lured Inn has central heat and air conditioning for your year round comfort and there are ceiling fans in each of the 5 bedrooms. Four of the bedrooms have queen beds and one has twin beds. Lastly, is a daybed in the loft area. Three of the bedrooms have their own televisions and satellite receivers. The kitchen is fully equipped for the gourmand in your group and includes a dishwasher, disposal, coffee maker, microwave, and toaster as well as a food processor, crock pot, blender, hand mixer and a second coffee pot for large groups. There is a large laundry room complete with an iron and ironing board. There is also a telephone and answering machine provided for local calls. We also have plenty of entertainment options including a 52 inch flat screen HDTV in the great room with a DVD player for movie nights in front of the wood log fireplace. Downstairs in the recreation and game room is a 60 inch flat screen HDTV with Dish Network including movie channels and a DVR. (Other TV’s listed under Sleeping Arrangements below.) Enjoy shuffleboard (maybe even introduce this to the kids!) Play Foosball, cards, or enjoy the board games provided. There is also an extra bath with shower only.